We plan to stay close to home this summer and autumn. If you attend weaving shows please look for our shuttle retailers and shop with them! Blue Flag Handweaving, Bluster Bay’s retail store, will be a vendor at the Log Cabin Fiber Arts annual day-long spinning event on March 18 in Coeur d’Alene, Idaho. Shop with us at the Kootenai County Fairgrounds at 4056 N. Government Way from 9:00 AM until 4:00 PM. 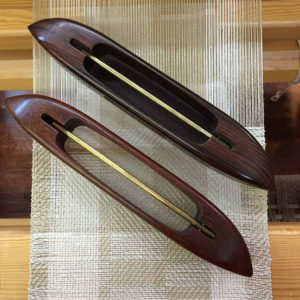 In addition to Bluster Bay shuttles, we will be selling bobbins, yarn, spinning fibers and taking registrations for upcoming weaving classes at our studio in Sandpoint.